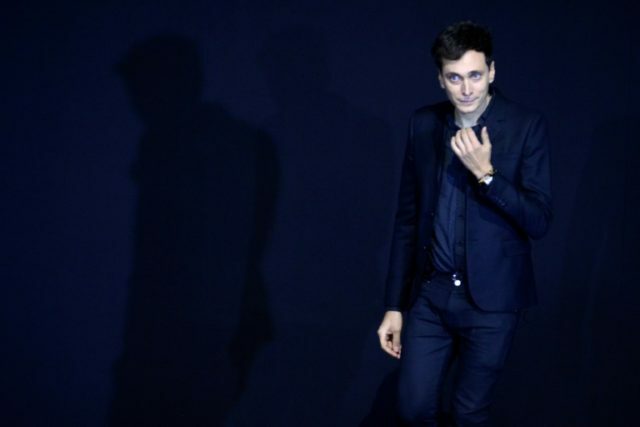 Paris (AFP) – Hedi Slimane, the designer who pioneered the skinny look at Dior and Saint Laurent, is to take over at Celine, the brand’s owners said Sunday. The 49-year-old French-born creator is one of fashion’s biggest and most enigmatic names, and his future has been surrounded by speculation since he walked away from Saint Laurent last year. The luxury giant LVMH, which owns Celine, has given Slimane complete control of the brand’s images and creative side in order to sign him up — a concession which put him alongside Chanel’s Karl Lagerfield as one of the most powerful designers in fashion. He has also been given his head to create a menswear line at the label, which up until now only made clothes for women. Announcing the surprise appointment, Bernard Arnault, the owner of LVMH, said: “He is one of the most talented designers of our time. “Hedi will oversee and develop all creativity for both women’s and men’s fashion, but also for leather goods, accessories and fragrances,” he added. “He will leverage his global vision and unique aesthetic virtuosity in further building an iconic French fashion house,” he added. Lagerfeld, who famously shed 41 kilos (90 pounds) in order to squeeze into his Slimane’s skinny jean, was the first to cheer the news. Like Lagerfeld, Slimane is a renowned photographer, and he has spent the last few years living in Los Angeles, where he had moved his studio at the end of his reign at Saint Laurent. The designer drew much of his inspiration from the LA rock, which he tirelessly documented with his photographs. AFP understands that he will that will continue to live in the city while he designs for Celine. “I am delighted to join Bernard Arnault in this all-embracing and fascinating mission for Celine,” Slimane said. Slimane will be reunited with Sidney Toledano, one of fashion’s most influential backroom figures, at Celine. The pair were a formidable team at Dior where Slimane was a huge trendsetter until his departure in 2012, designing for the late rock star David Bowie, with his skinny silhouette dominating men’s style for nearly a decade.